PRODUCT: ACRO 79000, EXTRA-LONG LADDER HOISTING WHEEL (DERRICK) WITH EXTENDED 24" HANDLE. PRICE/EACH. USE: 2-3 people are required. 3/4 inch x 100' Manila Rope, Natural Fiber Twisted 3-Strand, 4800 lb break strength, with 9/16 inch Forged Steel Snap Hook. 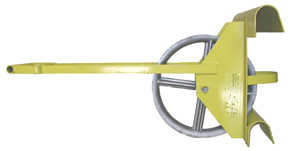 Commonly used as a Roofers Hoist Rope. Price/Each. 3/4 inch x 180' Manila Rope, Twisted 3-Strand, 4800 lb break strength, with 9/16 inch Forged Steel Snap Hook. Commonly used as a Roofers Hoist Rope. Price/Each. ACRO 11710 Ladder Stand Off / stabilizer. Price/Each.